How one day you’ll have nothing to remember your Second Life by, and possibly the real reason for that terms and conditions update. There are a couple of completely unrelated activities I’ve become involved in lately that have got me thinking about the stuff we hold on to. The first of these, in chronological order, is the clearing out of my mother’s attic. It’s a long overdue job and I’m approaching it slowly and methodically, going through everything one box at a time and sorting according to whether each item should be thrown out, scanned/photographed and thrown out, kept, or ebayed. After four, hour-long sessions, I’m approaching the end of my first box and there must be at least fifty boxes up there (most of them much larger than the one I’ve nearly finished). Many of the boxes haven’t been touched in over twenty years. When I committed to this project, I did so with a somewhat heavy heart and only because I knew that it had to be done sooner or later. Much to my surprise, however, I’m actually quite enjoying the task. I’ve discovered all kinds of things that have brought back memories of moments lost or simply a recollection of the world as it once was through my then more innocent eyes. Letters, photographs, Christmas cards, magazines, things my father wrote when he was alive, toys long forgotten; and so on. It’s nice to occasionally reconnect with how things once were, even if only for a few minutes. The second activity is far less wholesome for the soul. I’m somewhat ashamed to say I’ve become addicted to the online game ‘Simpsons Tapped Out’. Those of you familiar with this app for phones and tablets will know it involves creating your very own version of Springfield by saving up virtual dollars accrued through sending the various residents available on jobs; these dollars can then be used to buy land or construct buildings. All well and good, but the game involves a lot of waiting around because these jobs can take anything up to twenty-four hours for residents to complete, as can building construction. To get around this, you can speed everything up using the second currency of donuts. But here’s the catch: donuts can only be bought using real money, and this is where EA Games, the makers of Tapped Out, make their return on the app. Buying donuts is a temptation I’ve so far avoided, however there are clearly plenty of users who take this approach, since the game – free in all other respects – is reportedly a huge financial hit. How is this relevant to my musings on stuff? I went to a discussion forum a few days ago to find out what people were saying about a new set of quests that have recently been added to this game, with a whole new set of items than can be earned. People were discussing these with some excitement, and one of them eagerly posted, “I’ve got them all already with some donuts I got bought for my birthday”. It’s a funny old world. I can listen to some truly dreadful news items with the most dispassionate of responses, but for some reason this really hit me. Actually, anything concerning childhood innocence usually does it. I once saw a really aggressive kid I knew taking a glimpse through a crack he’d found in the papered-over window over of a Santa’s grotto and the look of childhood joy on his face made me want to blub uncontrollably. I assumed, you see, that this post had been written by a child (I might be wrong) and it upset me that for his or her birthday they had received something they would never one day be able to come across in their attic and hold and feel and smell. One day, Simpsons Tapped Out will be an obsolete title and all these purchased items will be gone. The game doesn’t work without a connection to the game server, and when it reaches the point, to quote Troy McClure, where it’s no longer profitable, that server will get its plug pulled and everything anyone ever ‘owned’ on it will vanish. As it is also with Second Life. Everything in our inventory – everything we think somehow belongs to us – actually resides on Linden servers which one day will get turned off. Everything: every picture, every notecard, every outfit, every building, every piece of furniture you ever bought or made, every trinket and curio, every garden feature, every single hairstyle you’ve ever worn; one day, it will all of it be gone. You do not own any of it. Whatever you think Second Life is, it cannot last forever. Whatever improvements are made to it, it will not in the long term be able to compete with new virtual worlds that aren’t built on an eleven year old architecture (happy birthday, by the way, SL). Eventually, there just won’t be enough people buying land or paying tier or purchasing stuff on the marketplace for Linden (or whoever ends up owning SL, if Linden one day decides to sell it) to make money out of it. Some people will definitively leave; others will drift over to new products and find their visits to the first ever virtual world less and less frequent. Whatever. Whether it’s a year from now or five or ten or twenty, that moment must inevitably come. There are things we can export, such as pictures and notecards and any objects we’ve built ourselves, but more or less anything we’ve bought or received from others is stuck forever in our inventory, and the stuff we can take out the majority of us will probably never get around to moving because there’s just too much of it. By the time we realise we want to keep hold of it because of the memories these things unlock, it will all be too late. The more and more I think about it, the more I feel a pull towards the conclusion that this inevitable, unavoidable truth is the real reason – or part of it, at least – why Linden changed its terms and conditions regarding ownership of inventory last year. Because we tend only to think in the here and now, this got misread as some sort of nefarious plot to make money out of our intellectual property. I don’t think it’s that at all; Linden denied this and we’ve yet to see any evidence to the contrary. But now that most commentators seem to agree that our metaverse is now entering its final age, anxiety at the labs over what rights people have to items in their inventories must have started to grow considerably. Solution: let everyone know that Linden owns the lot so that if (when) they chose to extinguish it, then they have every right to do so. What, if anything, can be done about this? Experimentally, I’ve exported a couple of items I made in the past to InWorldz and it worked okay – textures had to be uploaded separately, but that’s doable. InWorldz, however, isn’t all that different from SL as I understand it, insofar as it’s still one central organisation holding all the server space. OpenSim would appear to be a much better long-term storage option, since (as I understand it) you can use it to run your own region on your own PC, rather than having to connect to regions online. Still, this is only a solution for things you have actually made yourself, which in my case would be less than one per cent of my total inventory. And even some of those are un-exportable: much of my own furniture, for example, uses all-permission sculpted elements I’ve bought such as mattresses and cushions; using these in my items is entirely ‘legal’, but, when it comes to exporting, just one of them in an item I've made will block the whole thing from being saved to my hard disk. 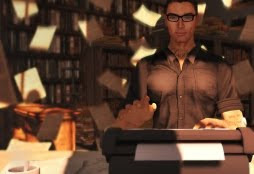 Perhaps, between now and the end of SL, someone will come up with some sort of magic tool – a deus ex machine to my prophecy of doom – that will allow the export and conversion of everything to some new virtual world we’re all emigrating to. I’m not technically knowledgeable enough to know whether such a thing might be possible, but even if it is it’s likely to cause an outcry among sellers, who have been fighting the copybots for years. It would probably get banned. We should probably reconcile ourselves, then, to saving what we can while we can. For my part, that will mean saving my snapshots to hard disk and maybe trying to take a few more pictures than I ordinarily do in the time we have remaining. Regarding objects, the vast majority of my stuff is junk I no longer use and I suppose it won’t be the end of the world if it should all pass into non-existence. Like so much stuff we get rid of in real life, pictures of it will suffice. There are a few gems here and there, however, which I will really, really miss: the first home I built (it included cheap bits and pieces I picked up from dollar stores), my unbelievably cool 70s bed (not actually finished as a saleable item yet, but you simply have to see the furry leopard skin cover), the neck chain my best friend Dizi made for me from a maze design (carved into stone at a place in Tintagel) when I told her how much I liked it. I would love one day, years from now, to come across these things in a virtual box in a virtual attic so that I can look at them for a while and enjoy the memories they evoke. But I’m pretty sure that I won’t.